When considering “going global” – when contemplating publishing multilingual material online – when developing a true presence on foreign search engines, the accuracy of the keyword strategy is crucial and should be viewed as a top priority. In fact, when targeting multilingual online markets, it takes much more than just localizing the content of your website into a foreign language and blindly translating the source code of your page (meta tags, etc.). 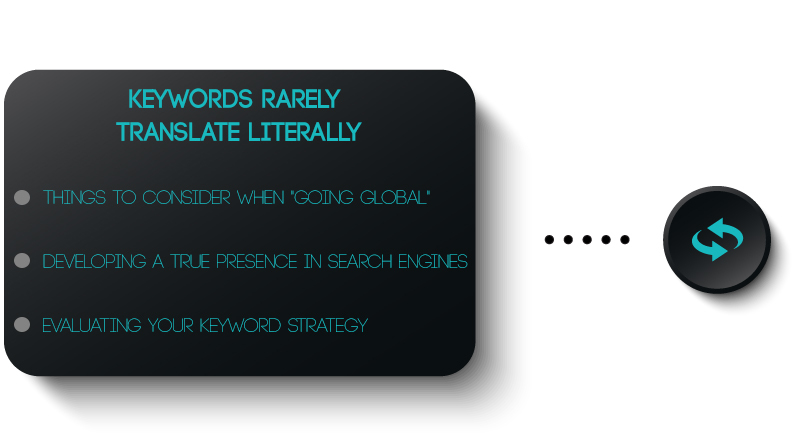 Firstly, it is to be understood that a true keyword analysis must be performed for each individual language. Your keyword family in English should only be considered as a guideline for the foreign native SEO technicians who will conduct your keyword analysis, ranging from terminology accuracy equivalents to keyword density factor evaluation, competition analysis, etc. Please note I did mention that such task should be performed by a qualified native SEO technician and not just by a translator, no matter how qualified the translator might be. The point I’m trying to make is that you would not let anyone evaluate your keyword strategy in English just because such individual’s mother tongue is English! Right? Anyway, back to the title of this article: Keywords Rarely Translate Literally. I thought of writing this article last week while on the phone with a prospective customer from the UK. This gentleman was packaging tours for youngsters traveling on the Bullet Train throughout Europe. He also had an office in Montreal and wanted to reach the market from Quebec as well. He was therefore interested in developing a presence on search engines in French. As he picked up from my accent that French was my mother tongue, he asked me how I would translate “Bullet Train” into French. If we were to do a literal translation, Bullet Train would turn into something with a “gun/arm” connotation. The French (who invented the Bullet Train) use the acronym “TGV”, which means “Train à Grande Vitesse” (high speed train). However, people on the French side of Belgium, such as in Brussels, refer to it as the “Thalys” since the company operating the Bullet Trains from Belgium is called Thalys. The above is only one slight example illustrating the intricate challenge which lays in defining the appropriate terminology. It gets even more complex when multilingual users create neologisms based on English terminology. As we all know, in all languages, lots of English words are being used, but in this particular train of thought, I am referring to words that have been made up or that are being used for a different meaning. For example, in French, “jogging” becomes “footing”, “baskets” refer to “tennis shoes” (I guess they got that one from basketball, but don’t mark my word – I have no clue! )…Let me even use an example related to the search engine optimization field: “link-building” creatively becomes for the French “netlinking”!! How about those keywords that just do not translate? Since French is my mother tongue, I will continue by using examples related to the French language. Let’s take “skateboard” as an example. “Skateboard” has an equivalent in French, which is “planche à roulettes”, but no one uses such redundant wording. “Skateboard” is what all French language native skateboarders would use. In the aforementioned example, in order to be found on French search engines when someone queries for “skateboard”, such keyword would have to be “embedded” within a genuine French content/text. In fact, you need to publish French content in order to be eligible for priority rankings on search engines in French. In other words, if your keyword is “skateboard”, at the end of the math, it will all be a matter of content relevancy. The reverse applies. If your business is English-language based and your keywords are “art déco” or “au pair” or “décolleté”, “eau de toilette”, “fiancé”, or “pied-à-terre”, in order to reach the U.S. online market or any other English-speaking online platform (UK, Australia, New Zealand, etc. ), such keywords would need to be featured within an English language content. I could go on and on to illustrate the complexity of keyword accuracy when considering global search engine optimization. It takes much more than just being bilingual. A successful international SEO campaign starts by teaming up with native, experienced, qualified keyword analysts who are fully in tune with the ranking algorithms proper to their mother tongue.